Get the most out of you time on this 2-hour tour and discover the most beautiful park in Madrid: El Retiro. 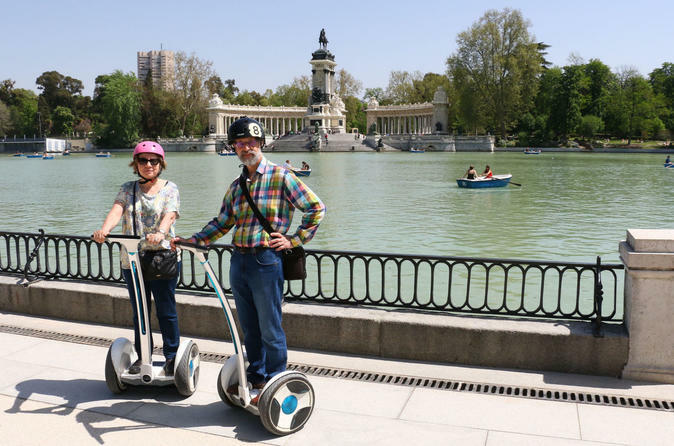 Visit also places such as the Mayor Square, the cozy Literary Quarter, the Prado Museum, the Alcalá Gate, the Cibeles Palace, or Puerta del Sol. Meet your guide and start with a safety briefing and a short training session. Start the tour by the Mayor Square and its 237 balconies to continue riding towars the cozy and beautiful Literary Quarter. Home of many Spanish classical writers and painters, it holds among its narrow and beautiful streets lot of design stores, antique shops, theatres, and pubs. Admire the impressive vertical garden and pass by the Prado Museum and Los Jerónimos Church. Enter to the park and glide through its paths and avenues to discover places such as the Cristal Palace or the Big Lake. Visit the fallen angel statue, the rose garden, the Velasquez Palace, the Philippe IV french garden, or the Forest of Remembrance. Get out of the park by the Indendence Gate to visit the Alcalá Gate. On the way back, pass by the magnificent Cibeles Palace, The National Bank of Spain, the Metrópolis building and the famous square or Puerta del Sol.